Julie Ferguson’s gut-wrenching post from Thursday morning, “It’s Spring…and the Start of Trench Death Season,” made me think of a truly remarkable gentleman that I met a few months ago in North Carolina – Bob Synnett. Mr. Synnett, or Safety Bob, as he’s known in the Carolinas, is a great big bundle of charismatic energy. I’ve been meaning to write about him for a while, and Julie’s post kicked my feeble brain into gear. I met Safety Bob when I visited my friend Charlie Tagman, CEO of CIC, the Carolinas AGC Insurance Company, in Charlotte, NC. One of the smartest people I know in the world of workers’ compensation, Charlie created TPA Associates in 1992 and sold the company to Meadowbrook Insurance Group in 1999. Following that, everyone expected him to fold his tents, steal off into the night and rest on his laurels. But if you know anything about entrepreneurs, you know that’s pathologically impossible. So Charley started helping out the CAGC Self-Insurance Trusts in North and South Carolina as a consultant. One thing led to another, and as he became more deeply involved, the CAGC leadership realized that the best thing for everyone would be to ask Charlie to take over the whole workers’ compensation operation as CEO. He did that, and in short order converted the Trusts into a domestic insurance carrier. Charlie had asked me to visit, take a look at the CIC operation and tell him what I thought. So after spending a couple of days in his relatively new, but extremely well run, insurance company, the best I could come up with, after 35 years in this business, was to suggest that perhaps he ought to move his desk about six inches to the right! Anyway, one of the very smart moves Charlie had made was to contract with Bob Synnett (you were wondering when I would get back to Safety Bob, weren’t you?) to provide safety and loss control services for his insureds in South Carolina. Bob Synnett is a Carolinian through and through. A graduate of the University of South Carolina, he played football on some pretty good Gamecock squads of the early 1980s under Coach Jim Carlen. A big guy, but never a starter, he told me that the high water mark of his college football career was being expected to tackle George Washington Rogers every afternoon at practice. Wincing slightly, he described some eye-popping bruises earned the hard way as he tried to get in front of the human locomotive who outpointed Hugh Green, of Pittsburgh, and Herschel Walker, of Georgia, to win the Heisman Trophy in 1980. Mr. Rogers was the irresistible force to Mr. Synnett’s very moveable object. Safety Bob knows his OSHA up and down, back and forth. But what he really excels in is training. He’s created a safety orientation DVD for employees in the construction industry that had me hooked within the first five minutes. Although the DVD is aimed at new employees, it’s a superb refresher course for everyone. Here’s a link to some excerpts. The excerpt on excavation and trenching is well done and truly memorable, and makes Julie’s post of 26 March hit home even harder. At the Insider, we have a rule about remaining objective and independent. We also don’t usually recommend or hype commercial products. But for today only, I’m bending that rule a little bit by suggesting that, if you have anything to do with the construction industry, you could do a lot worse than checking out Bob Synnett’s new employee indoctrination video. Lynch Ryan staff has shown this video to about 300 contractor employers during training seminars. Viewers have been universally impressed. I’m betting that will be your reaction, as well. By the way, the DVD comes in both English and Spanish versions. Finally, in the department of full disclosure, neither Lynch Ryan nor Workers Comp Insider has any commercial of financial relationship with either Safety Bob or any other provider of loss control services. Just a short post we though you might enjoy – At Work, a beautiful portfolio of photos of people’s work lives from around the world. This appeared in The Boston Globe’s wonderful feature called The Big Picture – if you aren’t familiar with it, check out a few of the other topical or news-related photo essays, which are posted every few days – they are always worth a look. Almost with the predictability of the swallows returning to Capistrano, the spring ushers in a season of frustratingly preventable trench deaths. Earlier this week, a Baltimore worker narrowly escaped death after spending 6 hours buried up to his chest in dirt. He had been digging in a 10 foot trench that was apparently unsecured. Firefighters who were on the scene talk about the hazards of a trench collapse rescue. All too often, others die trying to rescue a trapped co-worker- secondary collapses are common. That’s what happened last September when three co-workers jumped into a ditch to try to save a buried colleague – four fatalities ensued. Mahon said the trench was about as wide as a pickup truck. The men were buried in an area whose size he compared to a queen-sized bed. One of the men was buried on top of another, he said, and right next to them the two other men were stacked on top of each other. These are needless and preventable deaths – authorities sometimes call them manslaughter. Effective trench control methods exist and are well documented. All trenches over five feet deep are required by OSHA to be protected by sloping, shoring, or employing a steel cage or trench shield. We’ve compiled several good resources on prevention and worker training – if you work in road crews or construction, please take a few minutes to read our post from last July, Buried Alive. The Mercury News offers some potentially bad news for California employers. After four years of comp reform, with rates dropping a staggering 63 percent, the trend is now headed – perhaps precipitously – in the other direction. The Workers’ Compensation Insurance Rating Bureau is requesting an increase of 24.4 percent, due mostly to sharp increases in medical costs. The gist of the editorial is simple: we need health care reform in order to tame workers comp costs in California (and, presumably, the nation). Most people would agree that reform of conventional health insurance is needed. There are millions of people without coverage across the states and the number is growing by the minute. But the relationship of any such reform to the cost of workers compensation is by no means linear. As we saw during the aborted attempt at health care reform during the Clinton administration, solving one problem (access to health care) might well create others (soaring costs for workers comp). In conventional health insurance, treatment decisions are made primarily by doctors and patients, along with the patient’s family. Insurance carriers review the decisions to make sure they are within treatment guidelines. There are two fundamental sticking points: insurer approval for exotic, untested treatments (lots of push back here) and insurer approval for expensive drugs/treatment protocols (push back here as well). 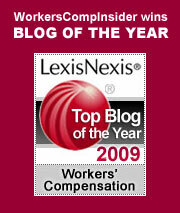 The decision process in workers comp has one additional over-riding factor and one additional party: the factor is the goal of return to work (which may or may not be the goal of conventional healthcare); the additional party is the employer, who is paying the bills (either as a self-insured or through the experience rating process for comp premiums). The Mercury News assumes that solving the health care problem will naturally solve the comp problem at the same time. This may not be the case. The medical portion of workers comp has a unique and relentless focus: returning injured workers to productive employment as quickly as possible. Under conventional health care, this goal might seem simplistic or even counter-productive: the workplace might aggravate the health problem, in the form of repetitive movements, physically demanding tasks, toxic exposures or even stress. In some circumstances, caring physicians will hesitate sending their patients back into these compromising situations. Where occupational medicine assumes that return to work is almost always a positive goal, family medicine may differ. The medical portion of workers comp is only 2 or 3 percent of total health care costs, so it will be tempting to ignore the comp factor as new national health policies are developed. This would be a mistake. Unless policy makers are prepared to undo nearly 100 years of workers comp protection, they must take into account comp’s unique benefit structure, which includes lower cost of treatment for workers, the involvement of the employer in decision-making, and indemnity payments during the period of disabilty. For injured workers and their families treatment under comp is always cheaper than treatment under conventional health plans, because there are no co-pays and no deductibles in comp. In addition, treatment decisions for work-related injuries include input from the employer, who is generally not a participant in conventional health care decisions. Finally, comp offers a virtually universal indemnity plan for injured American workers; they are paid during the period they are unable to work. Comp requires a special focus. Even if policy makers succeed in achieving universal health care for all Americans, they will not necessarily solve – indeed, they may aggravate – the problem of rising costs for workers comp. As Washington tackles the problem of health care for Americans, the Insider will continue to focus on the policy implications for workers comp. It’s a small piece of the puzzle, to be sure, but one of paramount importance to us. Visit the “spring has nearly sprung” edition of Health Wonk Review at David Harlow’s HealthBlawg – it’s an eclectic issue covering posts on health reform, prescription drugs, how social media is reshaping health care, medical tourism, technology, and more. David also invites you to follow his tweets on his twitter feed. Shift Work and Breast Cancer: A Presumptive Link? Marcellus, a character in Shakespeare’s Hamlet, muses that there is “something rotten in the state of Denmark.” To the contrary, there is a spirit of generosity in Denmark that is increasingly rare in this troubled world. We are dealing here with the issue of compensability of cancers that may or may not be work related. As we have discussed in previous blogs, in the states, unless cancer-suffering workers are firefighters, they are unlikely to receive comp benefits for any forms of cancer. Most doctors are reluctant to establish a definitive link between workplace exposures and cancers, even when there is compelling evidence of a connection. Denmark has a different take on the matter. Thirty-seven women in Denmark have won the right to compensation after claiming that their breast cancer was linked to their long-term (20 plus years) of night shift work. (We have blogged the possible link between shift work and cancer here.) The state-run disability agency received 75 applications for compensation in 2008. They awarded benefits in 37 cases, as they could find no other significant factors that might explain the development of breast cancer. Some of the latest collective bargaining decisions have been an increase of the annual holiday from five to six weeks at some workplaces, an increased proportion of the wages set aside for pensions and increased access to further education. In the new agreements in 2007, many industries introduced three weeks’ paternity leave on full pay. Woman already have four weeks’ pregnancy leave and 20 weeks’ maternity leave. I know that some of our readers will chastise the Danes for operating a welfare state. Certainly, the Danish tax structure reflects the costs of providing robust benefits for all workers. But Denmark has a total population of only 5.5 million – one metropolitan area in the states. The scale of their social engineering is tiny by American standards. In these days of market turmoil, where scoundrels cash out huge bonuses and ordinary workers struggle to support their families, we might take a few moments to question the efficiency and fairness of unbridled markets. In times like these, a case can be made for a strong government presence, and, perhaps, for generosity itself. As Hamlet reminds us, “there is nothing either good or bad, but thinking makes it so.” Given the state of the economy, we have a lot of thinking to do. Labor leaders and business leaders are in agreement that the new administration will mean a more activist OSHA, with more targeted investigations and tougher penalties for hiding workplace injuries. Some predict that there will be an increase in standards – although that shouldn’t be a tough record to beat since there was only one standard issued under the Bush administration for Hexavalent Chromium and that occurred under court order. Others think that employer penalties for willful violation of safety standards that result in injuries or deaths could also become a reality. Health and safety advocates and labor leaders are hoping that the new administration will undo some of the backsliding in terms of safety regulations and standards that occurred during the prior administration. Among the campaign promises he made, Barrack Obama’s platform included a pledge to increase worker safety. So far he appears to be making good on that promise. OSHA got a 6% increase for 2009, or an additional $27 million, to bring the agency’s total budget for the year to $513. The Bureau of Labor Statistics also was increased by $52 million, some of which is for tracking injury and illness statistics. He has also proposed raising discretionary funding for the Department of Labor by $1.5 billion by 2010, with a sizable portion to go to OSHA. At her recent swearing in ceremony, U.S. Secretary of Labor Hilda L. Solis put employers who are subjecting employees to dangerous working conditions or are shorting employee pay on notice: “Let me be clear, there is a new sheriff in town,” she stated, emphasizing her intention to use tough enforcement, transparency, cooperation and balance to protect workers. On the health and safety front, Solis has already taken action to expedite a standard to protect workers from bronchiolitis obliterans, a serious and potentially fatal lung disease associated with exposure to food flavorings containing diacetyl, or the so-called popcorn lung. Many think that progress will also be made on ergonomics and tuberculosis standards, as well as strengthened standards for crane safety.